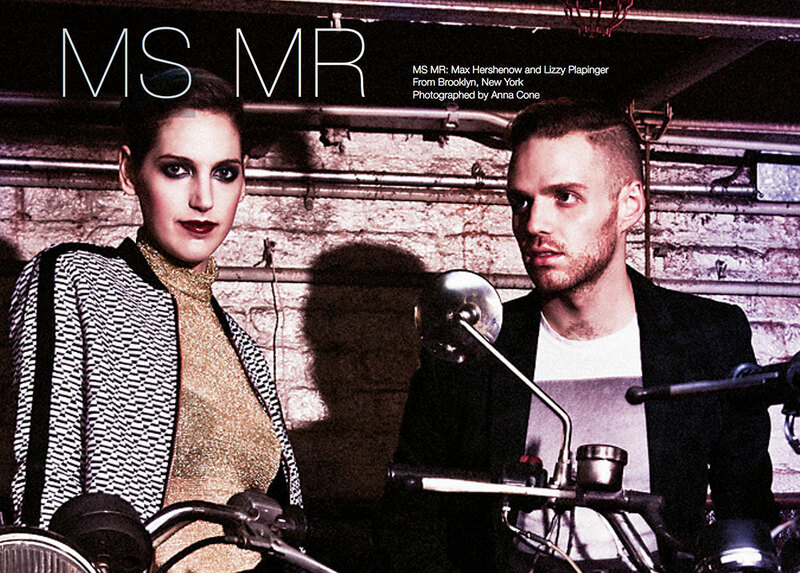 “We’re sort of interested in whatever box you think we fit in, but ultimately we see ourselves as pop artists,” says Lizzy, of the elusive duo MS MR, on the many genres that have been used to describe their music – including “glitch pop” and “chill wave.” “Those are labels we mockingly created when we first started, and it’s sort of become an ongoing joke that they’ve started to be used seriously.” Max and Lizzy have been playing live together for two years now. Lizzy has been working in production since she was a teen, and founded the now ubiquitous Neon Gold Records. Max is a pianist who began recording music in college to accompany his dance choreographies. They both moved to New York, connected via email, and the rest is history. The Untitled Magazine sat down for an exclusive interview with Lizzy and Max from MS MR for the Music Issue 6 (available in print and App editions). Check out the full Q&A below. The Untitled Magazine: Tell us about your beginnings in music? Lizzy: I’ve been working on the industry/business side of things since I was 18 at various labels: promo companies, radio stations, venues etc., all of which culminated in starting my own company, Neon Gold Records. But MS MR is my first time on the other side of things, finally giving me the chance to focus on the creative and find my dream musical partner in Max. Max: I’ve played piano my entire life, but never really focused on recording music until I started choreographing modern dance pieces in college. I wasn’t happy with the music I found, so I started recording piano parts to choreograph to. Then senior year, I produced a (very DIY) EP with a friend, and starting thinking about production as something I could maybe approach more seriously. After we graduated, Lizzy and I both moved to New York, connected via email, and this became the first project I’ve gotten to develop into a real band. UM: What does Ms MR mean to you? It’s a unique band name! MSMR: We liked how title prefixes were both formal and anonymous, but how totally mundane they become through their everyday use – that sort of high brow/low brow identity really appeals to us and felt reminiscent of our aesthetic. It also obviously alluded to the fact that we’re a boy and girl duo, which we loved. It also looks great written down. MSMR: We’re a new band, and with this being both of our first time in a band, we’ve only been performing live for about two years – but we both come from a performance background (whether it be in dance and/or theater) so it was already in our blood. UM: Do you ever get nervous performing live? UM: Do you prefer studio or live performance, and why? MSMR: We love performing, but ultimately our favorite thing about being a band is creating new music. We always wish we had more time to spend in the studio. MSMR: We initially released an EP called Ghost City USA that drew some attention, but it wasn’t until we released our online video for “Hurricane” that we really got noticed on a greater scale. UM: Do you have a favorite band or musician? Lizzy: Too many to name, but Beach House has always been a particularly special band to me. Max: Oh god, it literally changes weekly. This week I’m really feeling Bat for Lashes. UM: Who is the most inspirational person in the music industry? MSMR: We’re lucky to be surrounded by so many wonderful and experienced musicians, and people in the industry who we trust, and often turn to for guidance, but Tom Elmhirst (who mixed the record) has definitely taken on the role of an important mentor in our lives. UM: If you could be any other musician or band who would it be? Lizzy: Straight tie between Debbie Harry, Gwen Stefani and Shirley Manson. Max: I’d probably be a struggling choreographer. Lizzy: Probably an artist in another medium. UM: Are you a romantic or a rebel? UM: Why do you two like to keep a relatively low presence online? Is it part of the band’s mystique? MSMR: It’s sort of funny that we’re known for keeping a low presence online when the internet has been such an incredible source of inspiration for us, and is absolutely an important tool for us to release music. But we definitely started out consciously trying to keep the band from becoming too personality-based – we’re immensely proud of the fact that we’re making pop music, but we’re keenly aware of how pop can often be conflated with celebrity, which is not what we’re in this for. UM: What genre would you two place your music in? Some have called it “glitch pop” – do those labels hinder more than help? MSMR: Those are labels we mockingly created when we first started, and it’s sort of become an ongoing joke that they’ve started to be used seriously. That being said, they do work and neither help or hinder us. We’re sort of interested in whatever box you think we fit in, but ultimately we see ourselves as pop artists. UM: Do you have a specific “look” for yourself and / or the band? UM: Do you have a favorite designer or designers you like to collaborate with? MSMR: We haven’t had the opportunity yet, but it’s certainly something we’re hoping for in the future! We’re really great fans of Jeremy Scott and House of Holland. UM: What is it about music that you love? Lizzy: How it can be both communal and personal all at once. Max: My experience producing music is basically an exhausting, interminable, often maddening and hopefully inspired search for the perfect balance in a track. But the feeling when everything comes together and reaches a sort of stasis is indescribably satisfying (and addictive, or I wouldn’t keep coming back). Max: Again, it changes weekly, but my current favorite on our album is probably “Dark Doo Wop” – the message is so simple, but I’m really proud of the production and the way we pulled together seemingly incompatible references to create a unique sound. Lizzy: Ditto – it changes all the time, but right now I think it’s “Ash Tree Lane.” It had started as an entirely different track, but when it wasn’t working, we kept experimenting until it turned into a completely different beast. I love a challenge. UM: What is your current favorite playlist? For more music coverage check out The Untitled Magazine Music Issue 6!